Research suggests that people who keep gratitude journals are 25% happier? And who wouldn’t want to be 25% happier? So how keep a gratitude journal? I no longer even know where my journal is. So I bought Dr. Amen’s Change your Brain, Change your Body Journal,which has spaces to record your 5 reasons for gratitude; your exercise; diet; vitamins, prevailing positivity or negativity, and other brain healthy habits. I have long been told of the benefits of recording what you eat. Perhaps this journal will make it simpler. Interestingly, just knowing that I am going to record 5 things at night, keeps me alert to recognize them during the day. Cultivates an attitude of gratitude. For instance, I recorded today that glory be! !–both the massive overgrown climbing pink roses and the climbing yellow roses we inherited with the house have burst into luxuriant blossom in our week away–and are almost singing!! That Irene got into the finals of her speech competition. That she has such a good circle of friends. That Roy arrived home safely from a drive to London, when he was exhausted. That I have easily found a good camper van to possibly buy. I learnt about Dr. Amen, a psychiatrist, from Rick Warren’s Daniel Plan, which Amen co-wrote. I am reading his The Brain Healthy Way to get Thinner, Smarter and Happier, and trying some of his tips. I am also reading Gretchen Rubin’s The Happiness Project, though, interestingly, I am happy. My happiness varies from day to day, but it surrounds me, like “the happiness fog,” Rubin talks about. The project I would most like to successfully embark on and complete would be a discipline project, a productivity project, or a weight-loss project. But some of Rubin’s suggestions would work for these too. Rubin’s book, incidentally, is fascinating. Happiness has been extensively studied for centuries, particularly recently, and, as she says, the laws of happiness are as fixed as the laws of chemistry. Rubins explains that 50 percent of a person’s happiness is determined by genetics, by their “set-point of happiness.”(Fortunately, I have always had a sanguine, optimistic disposition, and a high happiness set-point.) Life circumstances, such as age, gender ethnicity, marital status, income, health, occupation and religion account for 10-20% of one’s happiness. The remainder is a product of how a person thinks and acts. Isn’t that amazing? That our life’s circumstances only affect 10-20 % of our happiness, and 30 % depends on our attitude. (And I can tell you, from my own experience of having had a very bad attitude that this is true!!). And so Rubin starts her happiness project with the determination to sleep more and to exercise, having discovered that these directly affect happiness. She decides that outer order would bring inner peace, and starts a massive decluttering project. So, her method of sleeping more is the radical one of switching off the light at 9.30 p.m., even if she was wide awake. I have started doing this since I started the Daniel Plan–switching off my light at 10.40 p.m., which is an effort for me, since I am more creative at night. And so, I have been using the extra time for prayer, and have been waking significantly earlier. 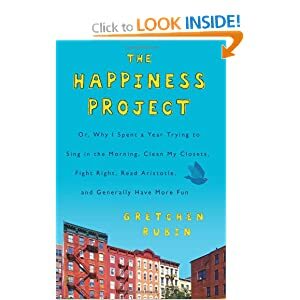 Rubin’s other happiness projects were using a pedometer to walk 10,000 steps, and working out with weights. Sadly, I have never got to 10,000, and have neglected weights, since I started prayer walking. Must weave this back into my life. The last of her happiness resolutions for the first month of her project was decluttering. Mess has been a bug bear in our lives in the past, and we have set aside a few hours a week to declutter for the last 4 years. But there is still clutter to go, alas—and it is motivational and happy-making to get rid of it. Rubin cites studies which suggest that getting rid of clutter reduces housework time by 40%!! That’s an incentive, isn’t it? Last month, my leveraged small step to revise my life was decluttering for 15 minutes a day. Well, on the 15th of July, Roy’s brother Jeph, his sister-in-law Kaaren, and 4 children, twin girls of Irene’s age, and a younger boy and a preschool girl are visiting. 6 additional people. Cooking meals for ten!! Well, I can’t get my mind around that yet. But I do know that I will have to declutter a lot to have the house brighter, airy, more hospitable (and child-proofed!!). So my plan is to gradually increase my decluttering time by 5 minutes a day, until I am doing 90 minutes a day of tossing, giving away or putting away. Until the 15th of July. By when several rooms should be totally decluttered. And I will then add a new good habit to increase productivity, discipline or good health. And get my life into a continuing virtuous circle.